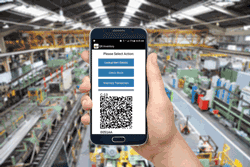 Video overview of QR Inventory : modern, lightweight yet powerful qr codes based inventory management solution for small and medium-size business. QR Inventory is best suited for the businesses who need to track assets and inventory in multiple locations, both permanent (such as warehouse), temporary (such as a job site), and mobile (such as service vans). It uses regular smartphones as scanners / mobile computers, which allows employees to process inventory and asset transactions in real time where they are taking place: in the warehouse, on the factory floor, in the field, at a customer site, and anywhere else where company's assets and inventoty may be located. You do not need to purchase expensive hardware - your employees can use their own smartphones to process inventory and look up assets and inventory information. QR Inventory supports QR codes, regular UPC barcodes and NFC tags. Do you have assets and / or inventory items which already have manufacturer barcodes? In this case you do not need to do any additional labeling - scan barcode label with a smartphone to record inventory transactions / look up details. Your assets and inventory are not labeled? QR Inventory comes with built in QR code generator. You can generate, lay out and print QR codes using QR Inventory web interface. All businesses have different workflow and inventory / asset management requirements. QR Inventory takes it into account. Using QR Inventory, you can define what you want to track, report and record via the web interface. Create custom transaction types (such as check in, check out, take inventory out for a job, transfer to a different location, send to repair, return unused inventory, etc., etc.) via the web interface. Define what do you want to keep track of: job number, project, client, due date, etc. - and these fields willappear in a smartphone application for an employeeto fill out. Filter reports by custom properties, producing exact information that you need. Create custom fields for your assets and inventory to hold all required information, including images. This information may include item specifications, url to pdf documentation, user manual, emergency procedures, drawings and anything ele you need. Authorized employees can access this information by scanning QR code / barcode on the asset or inventory label with a smartphone. If it is your first inventory management or asset tracking software, your assets and inventory are probably not very organized, and you do not have a good idea of what you currently have and where your assets and inventory are located. QR Inventory let's you organize assets and inventory, label them and enter into the software in a fast and efficient way. Label an item, scan it with a smartphone, optionally use your phone to take photo(s), enter quantity and submit to the server. No need for to manually create list of items in each location, manually count inventory, and then transfer data to the computer - one scan and item information is in the system. Scanning and labeling assets and inventory in all locations takes hours rather then weeks or months.